Six Degrees of Separation? Creating Chaos or Authentic Communication? An as yet proven theory proposes that each person on the planet is connected by five to seven intermediaries or degrees.In other words, the friend of a friend of a friend connects us all. In 2001, Duncan Watts, a professor at Columbia University, continued his research based on the phenomenon and recreated Milgram’s experiment on the Internet. 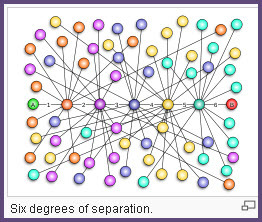 Watts found that the average number of intermediaries or degrees of separation was indeed, six. While it interesting to think that any president of the United States, connects to a factory worker in Vietnam who is an intermediary of a tulip grower in Holland, there are personal connections that create chaos in our relationships and affect our communication and thinking. Do you often like or dislike people when you first meet them? Association is a connection between how you feel and what you think about one person that you project or put on another. It does not have to happen consciously. This reaction to someone happens because, in some way, the new person reminds you of someone from your past. In psychological terms, it’s called transference. What about other types of connections that form associations? Classical conditioning is an example of association learning. Pavlov’s dogs learned and then responded accordingly to the bell. Whether rewarded with food or punished, each set of dogs associated the sound of the bell with a particular outcome. John Watson further refined this conditioning in his “Little Albert” studies. Initially, the nine-month-old did not react to the stimulus of rats, burning paper, a monkey, and a mask. However, loud noises were added when exposed to the rate and the child got fearful of rats. At a point, the loud noises stopped, but he still was fearful when he saw a rat. But it went beyond the rats; it then extended to Santa’s beard and Watson’s white hair. However, we usually don’t share the association if it’s negative. Would you say? But My Sister Is a Woman! Where’s the Association in That? One interesting aspect of association is that they do not have to be gender specific. I might meet a man who reminds me of my sister or my father’s traits show up in a new female boss. It is the connections and subtle triggers, not the gender that generates the association. Take a person who had a mother who didn’t seem to show love; no hugs and pats on the back for accomplishments or saying, “I love you.” Your new male boss looks cold and aloof. There’s an emotional distance when you communicate, and he seems unfriendly and unsociable. Unfortunately, you are operating from a script your boss has never seen. It’s in your mind and your association with your mother. The reality is that your new boss uprooted his family and moved 3,000 miles to take this job. His children are struggling with leaving friends and are mad and think he’s cruel to make them move their senior year in high school. His wife gave up a promising career, and she feels undervalued. He’s been accused of abandoning his aging parents by his siblings with this move. They think he’s selfish and self-centered. All of the other people in his life are demanding that he make them feel better or do something. Now you are doing much the same thing – demanding that he make you feel better. See how associations can create false impressions and chaos? This Jarod Kintz quote sounds amusing, however, there is much truth in it. “When I compliment you, I compliment myself because I am who I associate with.” We tend to react both positively and negatively when we meet people who remind us, on some level, of ourselves. When I was in substance abuse treatment, one of my first goals was, to be honest in recalling the past. If I was at fault, I acknowledged my responsibility. I found myself annoyed at another participant’s refusal to entertain the idea that she had any responsibility for her life outcomes. I would fidget, purse my mouth, or in some way convey that I didn’t like what she was saying. One of my counselors took me aside and asked why I reacted so unfavorably to her. Without knowing what to call it, I told him that it irritated me that she tried to manipulate her way out of her outcomes. I was upset that she tried to deflect responsibility for her choices and continue to change her story if confronted. His first question was, “Who does that remind you of?” I immediately recognized myself. If these reactions have happened to you before, explore some of the other unsaid thoughts and see if there’s association. Other times, the association is to a title, position, or past experiences that were embarrassing. While I liked my counselors, there was one who seemed to take pleasure in reprimanding participants. Each of us in that small group commented at lunch one day that we thought it was like going to the principal’s office. We were in trouble. Unfortunately, this association meant that most of us were defensive even before we got to the group. Rather than present alternative behaviors that would produce better outcomes, this counselor told us what, how, and why to change and then told us when. It was this lack of choice that fostered some of the resistance to authority. Since we had other groups together, it was clear that a defensive posture was not always the norm, yet in this group, even I found myself wondering what I would have to defend. Ever had someone break up with you and then list all the things wrong with you? You might already be reeling from the breakup and now heaped upon the hurt are all your negative qualities. Then, you don’t get a job promotion and feel ashamed and sad when your supervisor tells you why. Your emotional reaction to this seeming slight might be magnified by a recent romantic breakup. Age is also not a determining factor in the association.The illustration by Octavio Ocampo demonstrates how within each of us is a memory or illusion of what was. Hidden at first, we have to change our perspective to see the younger versions, but they are there.We sometimes have to look carefully to recognize our distorted perception of people in our associations as well. 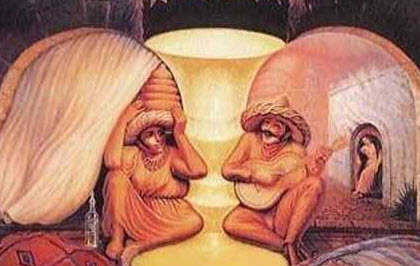 Often our attitudes about people are like the illustration, some see an old couple, and others see the younger version. In a work environment or with the extended family, it is a good idea to check your perception if others do not have the same issues in communication that you do. If you dislike someone but everyone else does, there may be an association for you that is not about the other person. 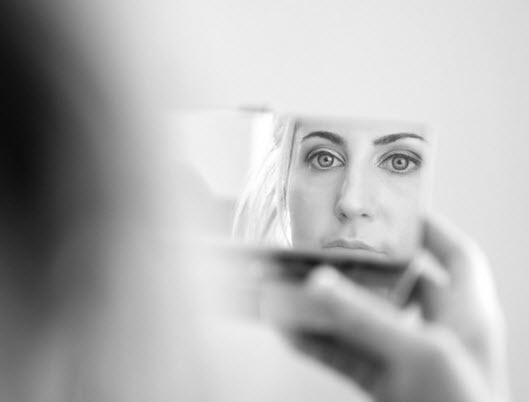 When our perceptions and relationships are negative, asking others for their opinion on how they see us interacting with someone might help process the reactions better and label the personal association. We are going to run into people in every aspect of our lives that we like and dislike. Another way to decide if there is an association is to reflect on how you would feel if, someone you liked said the same thing to you. • Would you process the information differently? • Are there people who you just tune out and dismiss? • Would you listen if you liked the person saying something? • Do you judge certain people as more credible than others? If you answered, yes to any of these, then you may be associating. What are You Missing When You Associate? Just as the bearer of bad news was killed by the king with little responsibility other than delivering the message, we can bypass the message and focus on the messenger. There are two primary problems with this. When you are dismissive of information based on the messenger, you might be missing something helpful. Jeffrey Wigand spoke out about the dangers of smoking. A PR firm, hired by Brown & Williamson mounted a merciless smear campaign designed solely to discredit Wigand. Why believe a raging alcoholic, wife-beater, and pathological liar? Many whistleblowers lose their careers and their families from the relentless attacks upon them, focusing our attention on perceptions of their character and not their message. The opposite association is valid as well. Just because you like the messenger, the information may not be correct. Take that American staple of cookie lovers everywhere and that iconic baby, Nestle. A few marketing companies have specialized in “disinformation”. Nestles hired Abelson Taylor to silence the facts about exporting infant formula to Africa that could not sustain life. Nestle had a campaign in Africa claiming that their formula was better for babies than breast milk. Hundreds of thousands of infants died from this deficient formula. To break down associations, identify who the person reminds you of; then make a conscious effort to not filter the message by the association or past connection. When you deliberately and intentionally refer to the new person, it helps remove the association. Don’t get swayed by outward appearances only. The added benefit of identifying your associations is that if you learn to communicate and process information better with the new person, it will probably help your old relationships as well. So, the next time that old-timer speaks, listen to the message, not the messenger – it might just save your life. Got a story or suggestion that will help someone in their recovery? Then consider a submission to From Addict 2 Advocate.